Drinking a fresh Cigar City Florida Cracker Belgian-style White Ale as the can suggests. How do I know it's fresh? The bottom of the can says it was canned on 06 DEC 2012. 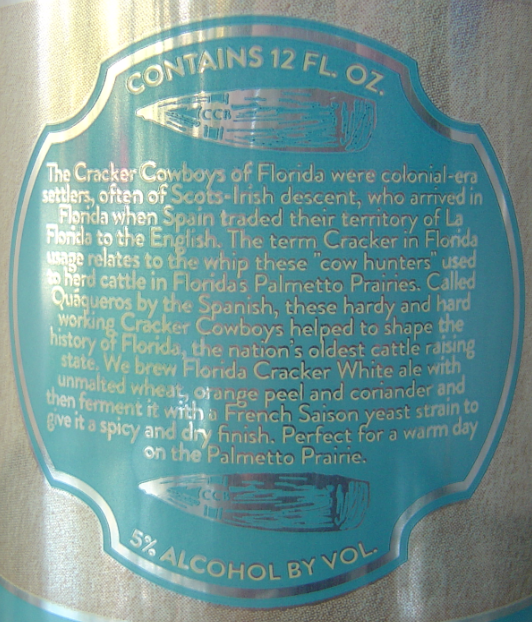 The can design shows a map of the state of Florida and offers a story on the back telling the origin of the word Cracker. Get out your microscope to be able to read the micro-print. I haven't checked yet, but perhaps my photo can be blown up to make it easier on your eyes. Basically, a cracker refers to the whips that cattle ranchers in Florida used back in the day when Spain gave up the land to the English. This beer was brewed to recognize their role in the history of Florida. Yeast and pale malt aroma with plenty of coriander and sweet oranges. The flavors mirror that, with a big dose of coriander and juicy oranges to start. High carbonation is noticeable from the beginning as well. Wheaty texture and flavor along with some pale malt cracker flavors. Finish is again yeasty. Flavorful and refreshing, perfect for an 85° December Florida day after a hard-core Wii Fit workout. Enjoyable. Drink Local. Sounds like you need to get into beer trading to me. There are also some online retailers that may have it.